Although my recipes in this blog are mostly vegetarian, I equally enjoy eating and cooking meat and seafood. Unfortunately my husband cannot eat most shellfish, which in fact is my favorite protein. So whenever I am not dining with him or he’s out of town I go hard on eating and cooking shellfish. Not that he banned me from eating them when he’s around, (he only pouts a little if I order them at restaurants sometimes) but sharing our food together is so important to us that I don’t want to cook or eat anything that he cannot enjoy. He was away for over 2 weeks recently, and I was able to come up with a couple of shellfish dishes that I really like during this time. 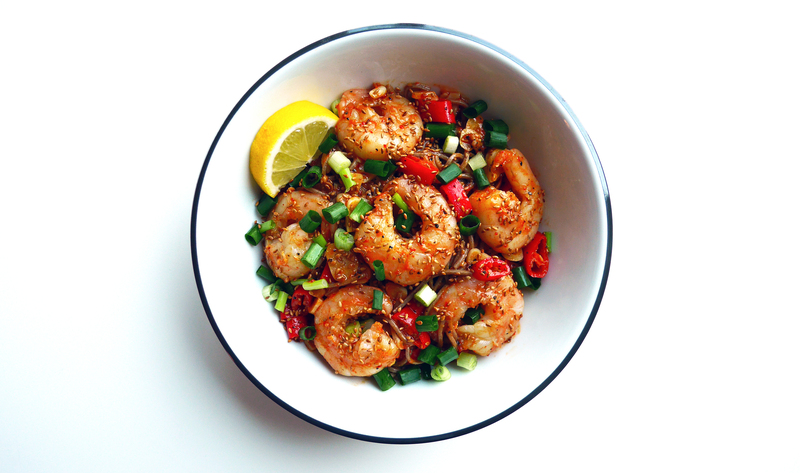 This prawn soba is one of them, and it is simple, healthy, and delicious. Fermented Korean soybean paste (doenjang) is our ultimate well-being food. I would even say that soybean paste stew (doenjang-jjigae) is Koreans’ soul food (If you want to know more about doenjang, click here). Probably the most well-known version of this stew is vegetarian, but we also love it with clams, mussels or prawns. I think meaty prawns hold the strong flavor of soybean paste really well. Like most of my Asian or Korean food I shared here, this dish definitely has a bold “in your face” kind of flavor. I hope you enjoy it, just don’t kiss anyone right after eating this ;-). 1. Peel prawns and remove intestinal tracts, or ask your fishmonger to do it for you. 2. Peel and thinly slice garlic cloves. Click here to learn how to peel a whole head of garlic quickly. Chop red chilis into 1cm and set them all aside. 3. Cook dried soba in a boiling water for 5 minutes. 4. Meanwhile, mix soybean paste, mirin, chili powder, pepper, lemon juice and water. Make sure the soybean paste is all dissolved. 5. Chop spring onion and toast sesame seeds in a dry pan. Set them aside. 6. When the noodles are done, drain and briefly rinse them under running water. 7. In a non-stick pan, add the sauce mixture with oil over medium heat. 8. 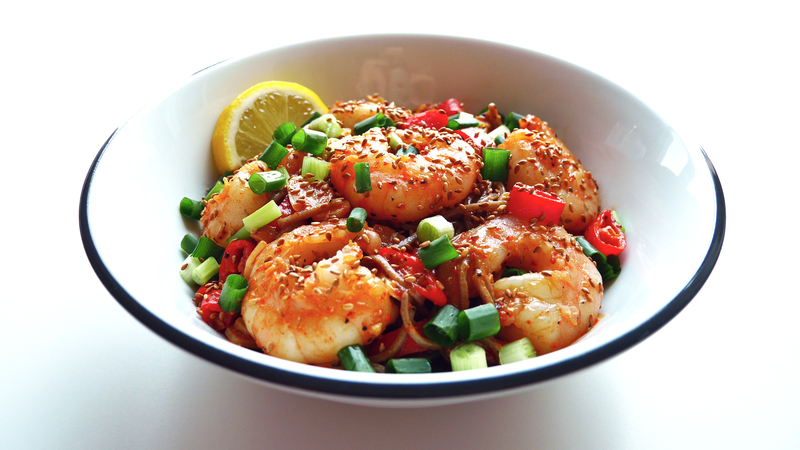 When it starts bubbling, add prawns, and chopped chilis. 9. After a minute add sliced garlics, and cook for another 3-4 minutes depending on the size of prawns. 10. Mix noodles into a pan, stir for 30 seconds before placing into a bowl. 11. Garnish with chopped spring onion and toasted sesame seeds. 12. Serve with a chunky slice of lemon. The final squeeze of lemon really brings out all the flavors.